House Science space subcommittee Chairman Steven Palazzo (R-Miss.). WASHINGTON — On the same day that another House panel approved the smallest NASA budget since 2007, the House Science space subcommittee approved — on a straight party-line vote — a two-year NASA authorization bill that would ban a proposed asteroid capture mission, cut back NASA's Earth science program, and mandate more crewed exploration of lunar space in preparation for an expedition to Mars. The NASA Authorization Act of 2013, written by the subcommittee’s Republican leadership, passed by a vote of 11 to 9, with no Democrats supporting the proposal and one Republican abstaining. The bill must still be approved by the full House Science, Space and Technology Committee before the House can vote on whether to send the proposal to the Senate. The subcommittee’s new authorization bill assumes Congress and the White House will not agree on an alternative to sequestration by the Oct. 1 start of the U.S. government’s 2014 budget year. But the bill would allow appropriators to put more money into NASA if Congress and the White House manage to reach a deal. Holding authorized funding to the sequestered level did not sit well with the subcommittee’s ranking Democrat, Rep. Donna Edwards (D-Md.). Edwards, as she promised July 8, attempted to substitute her own bill, which authorizes $18.1 billion for NASA in 2014 and 2015, for the Republican-authored proposal that ultimately was approved. Edwards insisted there was nothing in the Budget Control Act of 2011 that limits the funding ceilings authorizing committees can set for congressional appropriators. 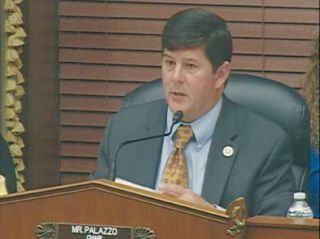 The subcommittee’s chairman, Rep. Steven Palazzo (R-Miss. ), did not buy that argument. "I share the concerns of many of my colleagues about sequestration," Palazzo said. "But at this time, it is the reality under which we must operate." Edwards’ bill, offered as an amendment in the nature of a substitute, was shot down along party lines, with all 12 subcommittee Republicans voting against it, and all nine Democrats for it. Rep. Eddie Bernice Johnson of Texas, the top Democrat on the full committee, chastised her Republican colleagues for authorizing such a low level of spending for NASA. "Some of my colleagues on the other side of the aisle may say that they have to cut NASA’s funding in the authorization bill because of sequestration," Johnson said. "That's simply not true ... if members want to force NASA’s authorization down to sequestration levels, they should not pretend that any law is forcing them to do so." Johnson added that the Republican bill would hurt NASA centers and the people who work there while "put[ting] NASA on a path to mediocrity." Ban a proposed mission to redirect an asteroid into lunar orbit where astronauts could visit the captured space rock in the 2020s using the Space Launch System (SLS) heavy-lift rocket and Orion crew capsule NASA is building. Authorize only $1.2 billion for NASA’s Earth Science Division, about 30 percent less than what the division got in 2012 and 2013. Some of this money would be given to the Planetary Science Division, which manages a portfolio of robotic solar system missions that enjoys support in both the House and Senate. Planetary Science would be authorized for $1.5 billion, about what it had in 2012, and $300 million more than it wound up with for 2013. Authorize $1.8 billion for SLS, without specifying how much should be spent on rocket development, ground infrastructure or program support. The subcommittee's previous draft of the authorization bill dictated specific amounts of funding for different parts of the SLS program. Authorize $1.2 billion for the Orion crew capsule, 7.7 percent more than in 2013 and even in 2012. Authorize $700 million for the Commercial Crew Program, which aims to get at least one privately designed crew transportation vehicle ready to launch astronauts to the international space station before the end of 2017.